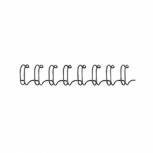 GBC Silver A4 6mm 34-Loop Binding Wires 3:1 Pitch (Pack of 100) RG810497U Pack of 1 GBC A4 6mm 34-Loop Wires 3:1 Pitch Silver Pk 100 RG810497 A4 Available in 3 different colours. Sizes range from 5mm-14mm. 3:1-34 available. A5 Ideal for smaller documents and cheaper postage costs. GBC MultiBind 8mm A4 70 Sheet Black Binding Wires (Pack of 100) RG810510 Pack of 1 Acco GBC A4 8mm 34-Loop Wires 3:1 Pitch Black Pk 100 RG810510 A4 Available in 3 different colours. Sizes range from 5mm-14mm. 3:1-34 available. 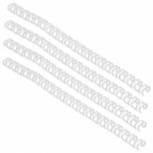 GBC WireBind 3:1 No.4 6mm A4 White Binding Wires (Pack of 100) RG810470 Pack of 1 Acco GBC A4 6mm 34-Loop Wires 3:1 Pitch White Pk 100 RG810470 A4 Available in 3 different colours. Sizes range from 5mm-14mm. 3:1-34 available. 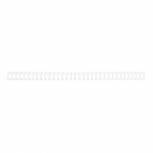 GBC MultiBind 6mm A4 55 Sheet Black Binding Wires (Pack of 100) 165023U Pack of 1 GBC Wires 21-Loop 6mm. Combining the strength of wire and the convenience of flat page opening, wire binding is the perfect way to finish those important documents. Pack of 100. Size: A4. Colour - Black. GBC MultiBind 21 Loop 85 Sheets 10mm Black Binding Wires (Pack of 100) 165221U Pack of 1 GBC 21 ring binding wire, size A4. For use with all 2:1 (21 ring) wire binding machines. Capacity - 10mm. Colour - Black. Fellowes 6mm Black Wire Binding Element (Pack of 100) 53218 Pack of 1 Fellowes Wire Binding Elements 34 loop with an element length of 30cm. Colour - Black 6mm (21-35 80g sheet capacity). Pack 100. 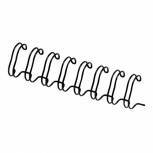 Fellowes 10mm Black Wire Binding Element (Pack of 100) 53265 Pack of 1 Fellowes Wire Binding Elements 34 loop with an element length of 30cm. Colour - Black 10mm (51-65 80g sheet capacity). Pack 100. Fellowes 12.7mm Black Wire Binding Element (Pack of 100) 53273 Pack of 1 Fellowes Wire Binding Elements 34 loop with an element length of 30cm. Colour - Black 12.7mm (81-100 80g sheet capacity). Pack 100. 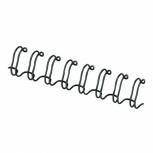 Fellowes 14.3mm Black Wire Binding Element (Pack of 100) 53277 Pack of 1 Fellowes Wire Binding Elements 34 loop with an element length of 30cm. Colour - Black 14.3mm (101-120 80g sheet capacity). Pack 100. 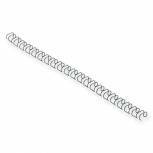 GBC WireBind 3:1 No.6 9.5mm A4 White Binding Wires (Pack of 100) RG810670 Pack of 1 Acco GBC A4 9. 5mm 34-Loop Wires 3:1 Pitch White Pk 100 RG810670 A4 Available in 3 different colours. Sizes range from 5mm-14mm. 3:1-34 available. A5 Ideal for smaller documents and cheaper postage costs. 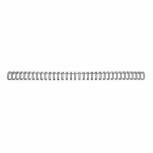 GBC MultiBind 8mm A4 70 Sheet Silver Binding Wires (Pack of 100) RG810597U Pack of 1 Acco GBC A4 8mm 34-Loop Wires 3:1 Pitch Silver Pk 100 RG810597 A4 Available in 3 different colours. Sizes range from 5mm-14mm. 3:1-34 available. GBC WireBind 3:1 No.5 8mm A4 White Binding Wires (Pack of 100) RG810570 Pack of 1 Acco GBC A4 8mm 34-Loop Wires 3:1 Pitch White Pk 100 RG810570 A4 Available in 3 different colours. Sizes range from 5mm-14mm. 3:1-34 available. 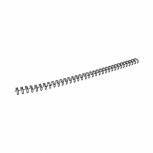 Fellowes 8mm Black Wire Binding Element (Pack of 100) 53261 Pack of 1 Fellowes Wire Binding Elements 34 loop with an element length of 30cm. Colour - Black 8 mm (36-50 80g sheet capacity). Pack 100. 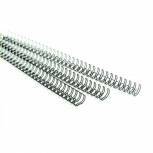 GBC MultiBind 12mm A4 130 Sheet Black Binding Wires (Pack of 100) 165320U Pack of 1 GBC 21 ring binding wire, size A4. For use with all 2:1 (21 ring) wire binding machines. Capacity - 12mm. Colour - Black. 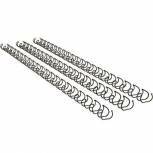 GBC WireBind 3:1 No.4 6mm A4 Black Binding Wires (Pack of 100) RG810410 Pack of 1 Acco GBC A4 6mm 34-Loop Wires 3:1 Pitch Black Pk 100 RG810410 A4 Available in 3 different colours. Sizes range from 5mm-14mm. 3:1-34 available. A5 Ideal for smaller documents and cheaper postage costs. GBC MultiBind 21 Loop 70 Sheets 8mm Black Binding Wires (Pack of 100) 165122U Pack of 1 Ibico wires 21-Loop 8mm. Combining the strength of wire and the convenience of flat page opening, wire binding is the perfect way to finish those important documents. Pack of 100. Size: A4. Colour - Black.